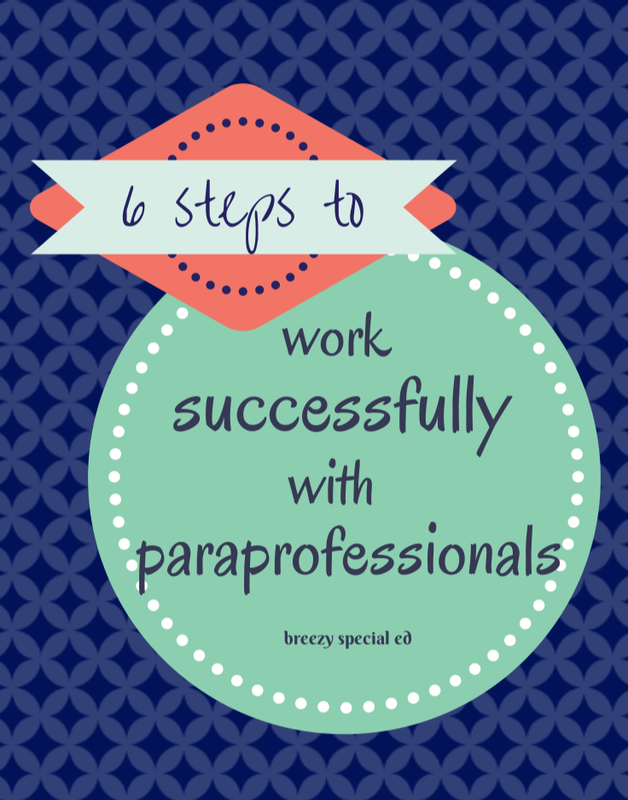 Part of being a special education teacher is working with paraprofessionals. Classroom and individual aides are a necessity for many of our classes and we couldn't do what we do without them! As awesome as having aides is, I know it can be difficult to manage so many different personalities and to make sure that your classroom goals (and students' goals) are being achieved. I am by no means an expert, but have learned a few things and hope to continue to improve my ability to work successfully with the paraprofessionals in my classroom. 1. Give clear and specific WRITTEN instructions from the beginning. But it can't only be written, you have to say it as well. I have found that it is easiest when you can direct the aides back to something concrete that is written as opposed to both of your trying to remember what you said. 2. Learn their strengths and weaknesses. This can help you determine where to best utilize each aide in your classroom. And don't feel like you need to guess! Directly ask your aides what they feel they are good at and what they aren't. Communication is so important! Then use that information accordingly. For example, don't put an aide who is slow at taking data in your station that requires high data collection. You'd just be setting yourself up for frustration. Try to place an aide who is strong in data collection in this area, or see how you can change your collection to make it faster for the aide. 3. Pair them with students that will play on their strengths. And don't be afraid to switch it up if it isn't working. Another reason why it is so important to know your aides strengths and weaknesses. For example, if an aide has medical issues and can't lift, you aren't going to want to put them with your student in a wheelchair. Some aides aren't comfortable with non-verbal students and other aides excel with non verbal students and communication devices. Know your aides in order to best meet your students' needs. 4. Give feedback immediately when possible. If they don't know they are doing something wrong, they are going to keep doing it that way unless you say something. And the longer you let it go, the harder it will be for them to change. This isn't their fault, it's hard to change habits, so try to be specific and let them know when something has to change. 5. Just like with our students, figure out how they learn best! Like it or not, a big part of our job is teaching our aides. Do they prefer to learn by observation or by written directions? Do they need to try it out first with you watching or without (sometimes by being there makes them nervous, and I have to be considerate of that while they are learning something new). Again, ask your aides how you can best help them. I'm sure they will appreciate this gesture. 6. Find a time to build personal relationships and also make it clear that that time is not during class. This is hard for me. I want to have a good relationship with my aides, but personal conversations can't happen during class time. This is a great expectation to have from the start, to welcome aides in before or after the bell to chat and show that you care, but when the students come into the room, they are the number one priority. 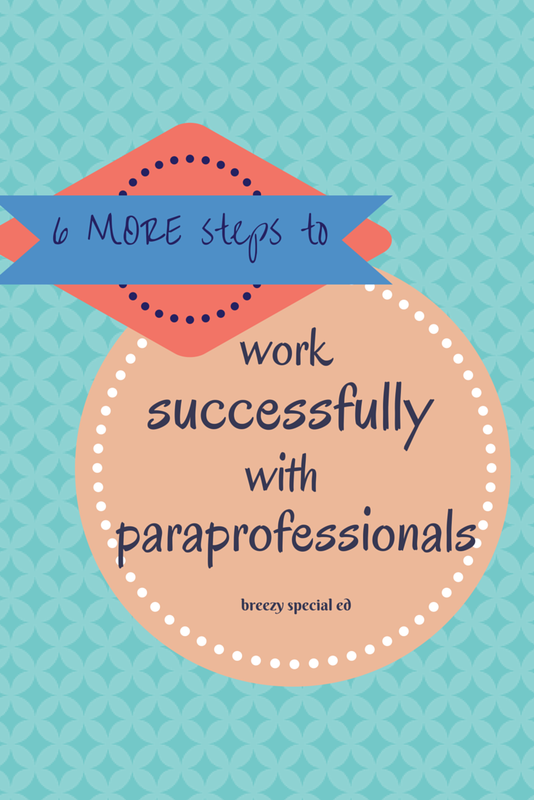 See part one on this topic, 6 steps to working successfully with paraprofessionals! Then you'll want to check out more advice for working with classroom aides, with Sped Station up next! Click the ball below to continue hoping through special education blogs on this topic. Thats a great idea about pairing up the paras with the students. I tend to spread them out throughout the class and students. Super idea! Great tips! I love how you made the point about learning styles. I think this is something we often forget about when teaching adults. Awesome advice! 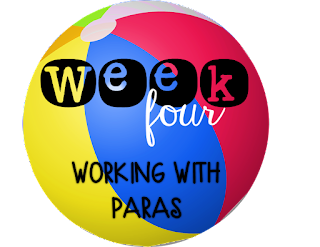 I had just posted a blog and did a periscope about working with paras last week! I love the fact that we are all sharing our tips and ideas to each other! Wonderful! I will have to check that out as well! I completely agree with making sure you give paras a written copy of expectations, instructions, etc. They are often flustered and overwhelmed just like us. It is good to have something to review if needed! Yes! I try to think about what I would appreciate when I am given directions. I think too often we assume our paras can read our minds, which doesn't help anyone! Great and truthful post!! I loved it so much that I went back and read your first 6 tips!! :) I especially love the one about documenting. It is so much easier to have a conversation when you have data and specific examples to back up what you are saying! Great tip! Also true! Finding ways to fill in that down time is SO IMPORTANT! Great tips! I had a teacher that gave feedback as the situation was happening. At first, I thought it was offensive, but then I saw myself doing it the correct way next time. It works! Thanks for these tips, Brie!! I really like the idea of making the expectations clear. I think most people want to do a good job. Having clear instructions about what the students need to accomplish helps. This is insulting. I take great pride in the fact that the school district I work for supports its paraprofessionals and trusts us to work with students without manuals or being micromanaged. We are in the classroom not only to work with our assigned students, but with any student who needs help. This makes it easier for teachers to work with small groups with being interrupted or having to constantly supervise us. Working with the teacher who wrote this article would like being back in kindergarten again. She obviously thinks that her paraprofessional is totally incapable of doing her job. That kind of lack of trust makes for a very poor working relationship. What would your advice be for working with paras who simply don't know how to work on academics? I'm taking over a class of high school OD and ID students who did nothing last year but watch movies and color. I was shocked to discover the two paras have very little knowledge of elementary academics. They resent me coming in and changing things. I hear a lot of negativity and constant questioning about why students are working on certain things. Even outright "he/she can't do that" comments. Before school started, I explained how I worked but I am wearing myself out everyday while one sleeps and the other is on her phone. Help.